Overview: it’s strange to think that once upon a time we were all just one cell. Cell division enables organisms to grow, replace damaged tissue and reproduce. Mitosis is the cell division associated with growth and asexual reproduction. One parent cell splits into two daughter cells following the replication (duplication) of the genetic material inside the nucleus. The daughter cells produced by mitosis are identical to the parent except for any mutations that may have taken place. Meiosis in contrast is the cell division associated with sexual reproduction. Here, one parent cell forms four haploid gametes, each containing half the amount of genetic information as their parent. Importantly, meiosis produces daughter cells that are different from each other and the parent cell – it introduces variation. Cancer is a disease caused by uncontrolled cell division – it’s when mitosis goes wrong. Many drugs that target cancer cells also target cells that divide – that’s one of the reasons for hair dropping out during chemotherapy. 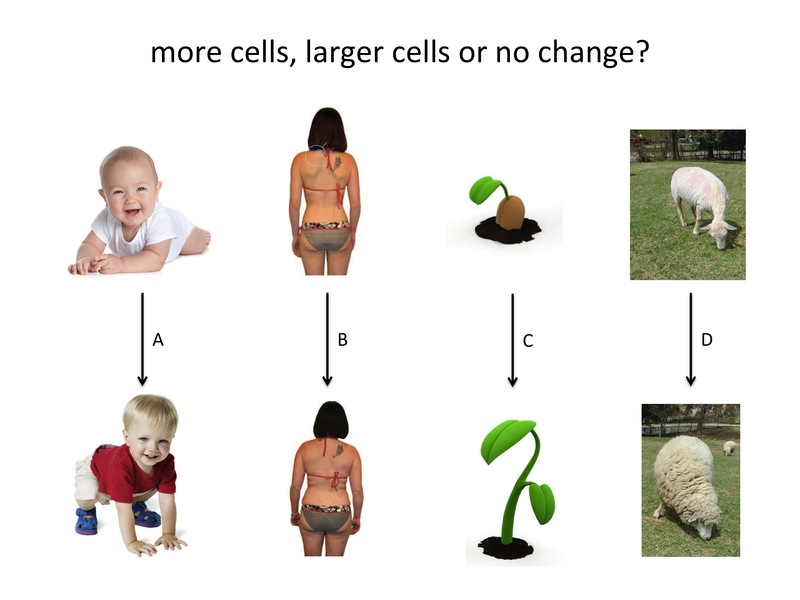 Key concept: cell division allows organisms to grow, replace damaged tissue and reproduce. When cell division is uncontrolled we get important human diseases such as cancer. Ask students to watch this excellent video showing a fertilised human egg undergoing its first few mitotic divisions.
. Then show a human karyotype and ask why chromosomes are arranged in pairs. Key Stage 3 worksheet to identify when cell division occurs. Students are given a series of pictures. They identify whether cell division has taken place. This is a great starting point to introduce mitosis. A fantastic collection of videos and images of cells provided by The Cell. These videos are freely available and can be used to show students the dynamic nature of cell division. Suggest why chemotherapy may cause hair to fall out. A cancerous cell divides uncontrollably once every hour. How many cancerous cells will be present after 24 hours?